Babcock-Davis' Safety Net is designed to be installed in floor door openings to reduce risks associated with falls. The safety net easily slides on guide rails to facilitate entry and then re-positioned to prevent fall through. 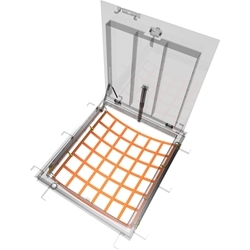 This system also prevents objects from falling through the opening onto people below. S - Stainless Steel 36" x 30"
BABCOCK-DAVIS warrants all Safety Nets to be free from manufacturing defects in materials, factory finishes, and workmanship for a period of five (5) years from the date of shipment.